Take The Last Exit to Nowhere! This has to be one of the most original concepts for a t-shirt store I’ve come across so far. If you’re a movie buff like me you’ll find their collection absolutely hilarious. Last Exit to Nowhere offers a glimpse into a possible parallel reality where the silver screen has come to life and events, characters and places depicted in the movies sit side-by-side with the everyday. 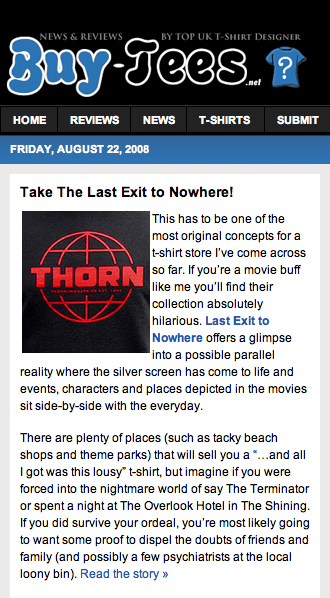 There are plenty of places (such as tacky beach shops and theme parks) that will sell you a “…and all I got was this lousy” t-shirt, but imagine if you were forced into the nightmare world of say The Terminator or spent a night at The Overlook Hotel in The Shining. If you did survive your ordeal, you’re most likely going to want some proof to dispel the doubts of friends and family (and possibly a few psychiatrists at the local loony bin). Well now you can, and to be honest this idea almost feels wasted on t-shirts, I wouldn’t be surprised to see this collection in a gallery one day, after all it’s inventively screwy as most Modern Art I’ve come across. Smashing down the barriers between reality (as we know it) and populist fiction (which we know so well it may as well be real); the modern myth written as a screenplay, our collective dreamscape discovered somewhere in the back lot of a Hollywood studio, and our ideas of time, space and existence almost recognisable under the weight of a century of celluloid fantasy.